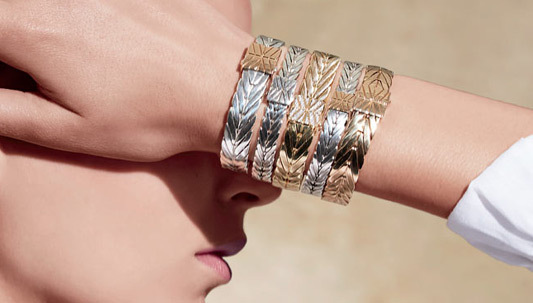 Keeping things fresh is a priority for the designers at John Hardy, so collections are continually undergoing metamorphosis. Sometimes, they even become their own collection, like John Hardy Modern Chain! The traditional Balinese weaving technique showcased in the Classic Chain collection men’s bracelets of the 1990s has been updated, in jewelry for men and women. Contemporary pieces feature flattened, slimmed downlinks of karat gold or sterling silver; some women’s rings, bracelets, necklaces, and earrings are enhanced with white diamonds or black sapphires; men’s bracelets are crafted in sterling silver and sterling silver with a gold clasp. The John Hardy Modern Chain collection joins Bamboo, Classic Chain, Dot, and Legends core collections, standing as a fifth foundation for the brand.